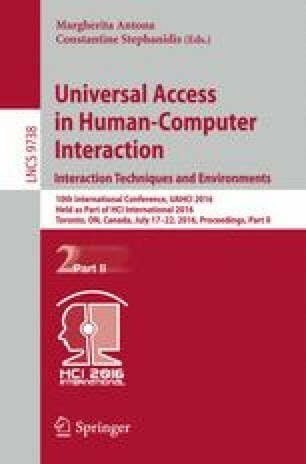 This paper introduces an alternative method of interaction over Graphical User Interfaces (GUIs), using a button enabled headset as a main Input/Output (IO) peripheral. This paper is focused on the underlying basis which is based on the results and implementation of an Android prototype once the viability for this system has been remarkably proven. Being blind Android users the initial target beneficiaries does not restrict the scope of this solution since its conceptual approach is scalable to other various systems and may be applied to mainstream users. Hence, the main objective is to create an alternative, effective and low cost mechanism for blind users or eyes free scenarios by means of the buttons built in modern media headsets; or in other words, the main motivation of this article is to present this solution as an alternative Human Machine Interaction (HMI) mechanism with the objective of proposing an elegant and comfortable way of interaction over specifically designed software; resulting in a plausible better solution for many use cases where the eyes free approach may be beneficial.